7. 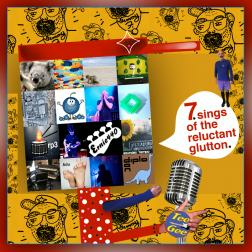 Sings of the reluctant glutton. So this offering is the 7th album featuring(well maybe "focused on") songs with singing with a few instrumentals thrown in for relief. Those few instrumental, instrumentals "sing" in some regards....I think you'll agree....and if you don't well...tomatoes! Potatoes! And however you say it. There are some great players and music beds to float vocals a top here and this time I included another vocalist - MasterX - singing on a guitar song I played. Quite nicely done by the Master! Big dawgs and small dawgs(and some mutant chihuahuas) collaborated and put their talents in to make hopefully something you'll enjoy! Starting the collection off with a "soft bang" Wade and Aussie friend set up a great template on which guitar and vocals are added, and the music rolls on and on! 14 songs worth! An epic 9 minute instrumental by eGil and myself and the partial(bizarre) tale of Mr. Glond's Noggin are a few in this collection which finishes out with TeeGee(Crooked Finger), Ernie440(Smooth Thumper) and myself as we kick outs da-ritt'umm, m'han! This album even wakes a hibernating waltzing Baer! Another great collection Jim! :) Borderline crazy, but full of creativity, humor and talent :D Bringing tons of fun to the loops! "What we have here is an ability to communicate" A quirky mix of intelligence and creativity with a dash of insanity. Really enjoying many of these little gems. Especially like the tracks with Ernie, eGil, Kimbo, Adu,...well, I guess everybody. The mellow track with Demian and Blueberry was a surprise...just lovely. Hey Jim, i like this álbum and im glad to be in one of the tracks. I like your way to understend the music, allways changing, searching new answers. You are a very creative man, and im happy to share with you here on wikiloops some moments of music and fun. From Argentina - land of Ginobili! !- i send you congratulations and keep rolling! you are the boss of ideas! Honoured to have played at on one of your tracks on this album. But "The love shines" is such a wonderfull song. What on space is going on here?? I had a good listen, interesting, out there, weird, crazy, cool stuff, all there. Keep going! P.S. I am (indeed) Crooked Finger, Ernie is Smooth Thumper, then you must be Whining Rumpelstiltskin?